Yamaha MSP7 Studio 130W Bi-amp Powered Monitor Speaker 6.5"
The choice of top recording and production engineers who demand unmatched accuracy and resolution that reveals critical sonic details. An unbeatable choice for production environments handling any combination of digital and analog sources in stereo or surround formats. 130 watts (LF 80W + HF 50W) dynamic bi-amplified power. 31 positions Level Control facilitates precise overall system level matching. Low Cut switch and TRIM Control (High/Low). Yamaha's "STUDIO" series monitors have been designed with serious monitoring in mind. Emphasis is on reference-quality reproduction precision that lets you hear sonic details, rather than flattering sound. They carry on in the tradition of the venerable NS10M STUDIO monitor speaker, which was the definitive near-field speaker monitor in an overwhelming majority of professional studios throughout the world for many years from the 80s onward. But technology has evolved dramatically right throughout the audio chain, and speakers must follow suit. The new top-of-the-line MSP7 STUDIO Powered Monitor Speaker is capable of delivering consistent quality and performance that you can rely on in modern production environments that handle any combination of digital and analog sources as well as stereo and surround formats. The trend towards choosing powered speakers for production monitoring is based on some very sound logic. By integrating and matching the power amplifiers and speakers, the relationship between them can be kept under perfect control for superior performance in the widest possible range of systems. Naturally the power amplifiers themselves are of the finest quality and, unlike component power amplifiers that must be designed for acceptable matching with the widest possible range of speakers, are designed and manufactured specifically to drive the system's woofer and tweeter in their specific enclosure. No matter where the MSP7 STUDIO monitors are used, and with what sources or other audio gear, you know that you're always receiving the benefits of a perfectly matched power amplifier and speaker system. You'll hear the difference. You'll also benefit from the convenience of not having to deal with external amplifiers and cabling. There are a number of advantages to multi-amp speaker setups, but the added cost and extra equipment required can make them impractical in many situations. With the MSP7 STUDIO everything you need is builtin - all you have to do is supply the line-level input. The 6.5 inch cone woofer is driven by an 80-watt power amplifier, while the 1 inch dome tweeter has its own 50-watt power amplifier. In the MSP7 STUDIO this particular power and driver combination results in the perfect balance between the low-mid and high frequency ranges. The frequency ranges are divided via a carefully designed electronic crossover before the power amplifier inputs, featuring steep 30-dB/octave roll-off curves in both the low- and high-pass filters. The steep roll-off minimizes inter-modulation between the frequency bands at the crossover point, achieving significantly smoother, cleaner crossover performance in the critical midrange. And the fact that the crossover is a linelevel electronic design completely eliminates the loss, distortion, and sometimes severe inter-modulation that are almost unavoidable in conventional passive crossover networks driven by a single power amplifier. The MSP7 STUDIO woofer and tweeter units feature some important design innovations that contribute directly to improved sound quality. The 6.5 inch woofer, for example, features a specially treated polypropylene cone with lowdamping rubber surrounds for exceptionally smooth response. Low-reflection highrigidity die-cast magnesium baskets both maximize mechanical precision while minimizing unwanted coloration of the speaker's output. The 1 inch tweeters feature titanium domes that offer the perfect combination of light weight and rigidity for precise reproduction right up to 40 kHz. The tweeters have a powerful magnetic circuit that results in extremely fast response for crisp, natural transients, and are integrated with a waveguide that achieves uniform high frequency dispersion of 120 degrees. But precision manufacturing makes a huge contribution to performance as well as basic materials and design. The slightest eccentricity in the alignment of the tweeter domes and waveguides, for example, can seriously affect performance. So can the alignment of the coils and magnetic circuits. 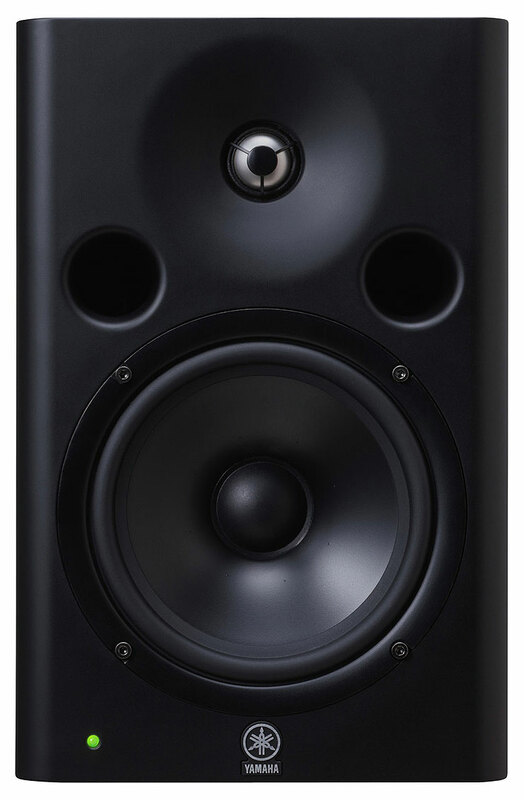 These are details that require a considerable investment of energy and resources to do properly, and they are exactly the details that make the MSP7 STUDIO the superior studio monitor that it is. In today's production environment, which often includes computer and video displays as well as a range of magnetic media, magnetic shielding is essential. Conventional magnetic shielding schemes have the unfortunate side effect of distorting the magnetic flux of the speaker's critical magnetic circuit. The end result is distorted sound. This obstacle was effectively overcome in the MSP7 STUDIO with a new "advanced magnetic structure" that achieves effective shielding while maintaining the integrity of the speaker's magnetic circuit for significantly lower distortion as well as an improved definition. Wood can be good, but synthetic materials have advanced to the point where they offer some overwhelming advantages. In addition to the fact that enclosures materials can be created with ideal density and resonance characteristics, they can be molded to almost any shape with precise tolerances. Where wood cabinets have glued joints that interrupt the continuity of the enclosure, the thick walled MSP7 STUDIO cabinet is molded in one piece, resulting in smooth acoustic transfer throughout the entire enclosure for superior reproduction precision. One-piece molding also makes it possible to produce the large-radius rounded baffle corners that help to maintain a natural wavefront and minimize diffraction for a smoother, more uniform polar response, as shown in the accompanying plots. Internal tweeter mounting also boosts high-frequency performance by eliminating spurious resonance from the tweeter frame. The MSP7 STUDIO features a balanced XLR-type connector for input. This provides direct compatibility with professional gear and allows the use of balanced lines for maximum audio quality even where long cable runs are required. Rear-panel controls include a continuous input sensitivity control, and trim switches that enable you to adjust the bass and treble in four and three positions, respectively (+1.5 dB/0 dB/-1.5 dB/-3 dB at 50 Hz and +1.5 dB/0 dB/-1.5 dB at 10 kHz), so that the system's response to be quickly matched to the room. There's also a low cut (FLAT, 80 Hz, 100 Hz) switch that is useful when the MSP7 STUDIO is used with the SW10 STUDIO subwoofer. The AC power cord is removable for easy transportation and setup. The MSP7 STUDIO features a refined appearance that is a perfect match for its outstanding monitor performance. It is in fact "functional beauty" that results from an uncompromising approach to reproduction quality. The elegant rounded baffle has been primarily designed for superior dispersion characteristics, and is visually balanced by a high-efficiency rounded heat sink on the rear panel. The integral waveguide horn also contributes to outstanding sound while adding to the speaker's visual appeal. Some speakers are designed to look good. The MSP7 STUDIO has been designed throughout for superior sound, and looks great as a result.